Most days we typically take showers not just because they (typically) consume less water, but also because they are much quicker, allowing us to go about our day and our many responsibilities. However, when time allows us to truly indulge, we can take luxurious baths instead of a quick shower. Baths have always been known to be much more relaxing, helping to cure us of any stress simply by sitting in the tub. For women who especially have a large bath set aside in their bathroom that rarely gets used, now is the time to dust it off and make the most of it. But even if you only have a small bath (you know, the ones that double as a shower as well), you can still indulge if you take the right steps. Let’s discuss why baths are such perfect tools for self-indulgence, and then give some tips for making the most out of this relaxing activity. Taking a long bath can be quite the relaxing, therapeutic activity! 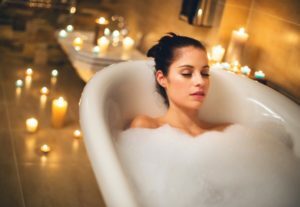 As we already mentioned above, simply sitting in a bathtub for a prolonged period can help you to relax and therefore reduce any stress that you may have built up. The biggest reason that this works is simply due to the juxtaposition to the typical shower that most women take daily. Compared to standing up and quickly getting out from under the shower to get dressed and go about your day, taking a bath can feel like a lifetime of stress-free relaxation. Baths act as mini-breaks where we have nothing to worry about, possibly for hours if we stay in that long! The actual sensation of being submerged in water is also a very calming effect that baths provide, for a couple of reasons. For one, the physical sensation of being in contact with the water is very soothing and can be quite meditative in and of itself. The water also is a way to clean your body, which is always a good feeling. But instead of just cleaning your body in the physical sense like with a typical shower, a bath can also clean you in a psychological sense, helping you to wash away all your cares and worries with every minute you lay in the tub. That all sounds pretty good right? If you think so too (and I know you do), then let’s get down to how to go about setting the perfect bath. There are many different things that all women should consider for getting the most out of their bath time. First and foremost, is the water that makes up your bath. The temperature should ideally be as hot as you can possibly withstand. Not only does this improve the meditative and soothing effects of the water on your body, but it also means that the water will take longer to get back to room temperature. Having said that though, if you really want to extend the length of your bath and don’t like the water temperature as it cools down, feel free to drain some of the water and replace it with more hot water. The other important aspect of filling your tub with water is how high to fill it. You want to fill it as much as possible, without making it too easy to splash water out onto the bathroom floor (after you’ve gotten inside the tub). For typical baths, this would be about 60% full, as once you submerge yourself, the water will probably rise to about 80% which is a safe level, assuming you are just going to lie still inside the tub. The next thing to consider is getting yourself a yummy drink while in your bath. While we at ASP recommend a nice red wine, any drink (even if it isn’t alcoholic) will do just fine, if it is something that you truly will enjoy. If you have more than a single glass worth of your drink of choice, take the entire bottle or carton or whatever it may be to the bath with you. The more that you have available to drink, the more of an excuse to stay in the tub longer! One thing to keep in mind, especially if your bath is on the smaller side, is to place your drink in a place where it is least likely to get knocked over. Try to keep the glass somewhere in your direct line of sight, which lower the risk of knocking it over substantially. Bring your favorite drink (such as wine) in with you to help make the most of your bath time. And lastly, there are all the extra amenities that you can add to enhance the ambiance of your bath. The most common amenity, that almost all baths make use, is bubbles! Simply add the liquid soap directly to the running stream of water as you fill the tub and the bubbles will start forming right away. Note that you don’t need any special bubble solution for this, as any shampoo or body wash can create bubbles when applied directly under the running water as previously described. Playing some soothing music while you bathe is also a viable option, although a lot of women prefer the peace and quiet so if you do decide to play some music in the background, try to keep it on quieter side. 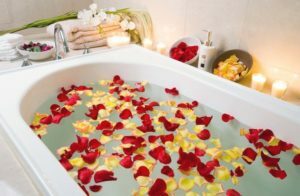 If you want to get fancy, you could even add some flower petals (typical rose petals) to the water, or some scented candles around the tub. Whatever you add is totally up to you. The main thing is to add elements to your bath that will help you to relax the most, since that is the whole point of taking your bath in the first place! Adding various elements to your bath such as flower petals or candles all help you to relax even further. Baths are as soothing as you make it! If you ever get the opportunity to draw out a nice bath for yourself, make sure you take advantage of it. You will feel much more relaxed and stress-free as a result, and not just during the bath itself but long after you finish as well. When drawing your bath keep in mind that making the most out of your bath is not just about how much water you use and at what temperature. Other elements come into play, such as having a drink on hand, using bubbles or flower petals, or simply enhancing the overall ambiance of the bathroom with candles or music. Take the time to think about how you want your bath session to be, and make it happen, because paying attention to all the little things will add up and make a huge difference on the overall quality and effectiveness of your bath!